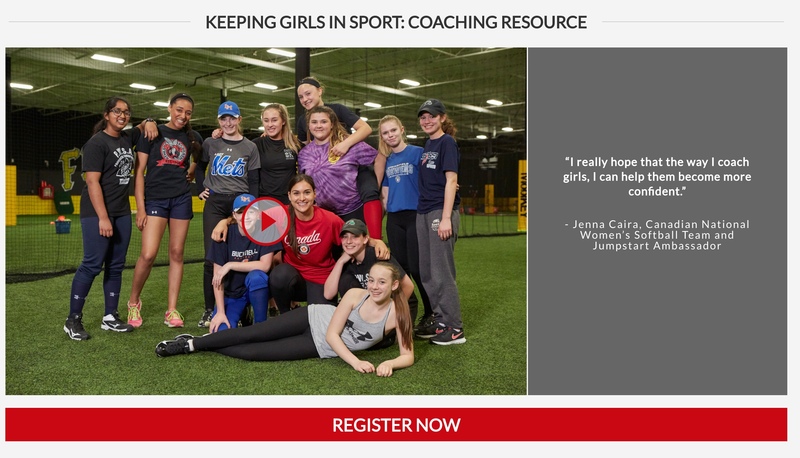 Keeping Girls in Sport is an online resource that teaches coaches and youth activity leaders how to create safe and respectful environments for girls, and ultimately, help girls stay enrolled and engaged in sport and physical activity. In partnership with the Coaching Association of Canada and the Canadian Association for the Advancement of Women in Sport , Canadian Tire Jumpstart Charities developed Keeping Girls in Sport with the expert input of Dr. Vicki Harber, professor emeritus in the faculty of physical education and recreation at the University of Alberta. Canadian Tire Jumpstart Charities is a national charity dedicated to helping kids, who otherwise might not have the chance to play, get in the game. Studies have repeatedly shown that during adolescence, girls drop out of sport at a significantly higher rate than boys. Along with removing financial and accessibility barriers to sport and recreation, Jumpstart is committed to helping girls get, and stay active for life. Beyond physical fitness, there are countless benefits to participating in sport and recreation. Sport fosters valuable life skills like confidence, resilience, and teamwork, and helps girls grow up to become strong leaders in their own communities and beyond. Since 2016, Jumpstart has hosted several Jumpstart Games for Girls across Canada. Inspired by Jumpstart’s Chairman Emeritus, Martha Billes, these games are a fun day of play where girls can be active, have fun, feel inspired to get into the game, and remain active throughout adolescence.